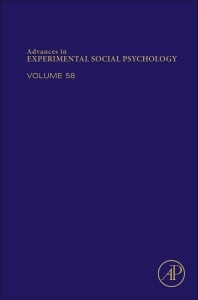 Advances in Experimental Social Psychology, Volume 58, the latest release in this highly cited series in the field, contains contributions of major empirical and theoretical interest that represent the best and brightest in new research, theory and practice in social psychology. This serial is part of the Social Sciences package on ScienceDirect, and is available online beginning with Volume 32. Updated sections in this release include chapters that cover Intergroup Emotions: Twenty Years of Theory and Research, The Dynamics of Belonging Regulation, an Evolutionary Theory of Loneliness, Attentional Processes in Social Perception, and the Assessment and Locomotion Conjunction.